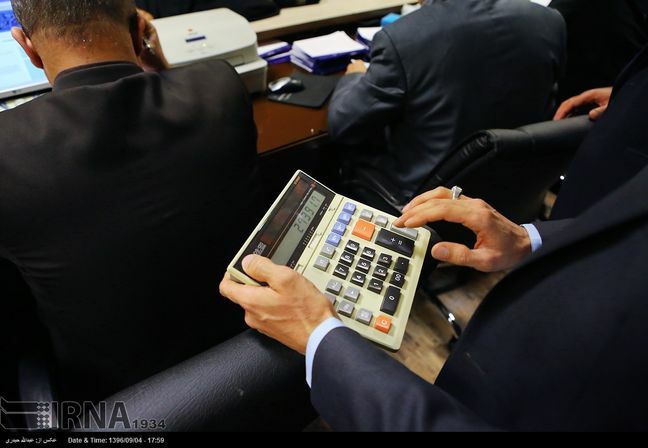 EghtesadOnline: Iran’s budget deficit came in bigger than expected in the first five months of the current fiscal year (March 21-Aug. 22) to reach 369.1 trillion rials ($2.49 billion), latest data released by the Central Bank of Iran show. The shortfall for the period was larger than the budget law’s forecast of 137 trillion rials ($925.67 million) for the five-month period. The deficit is 102% higher than that of the preceding year’s corresponding period. To cover the shortfall, the government sold 71.7% more bonds during the period compared with last year similar period—a total of 397.1 trillion rials ($2.68 billion), according to Financial Tribune. The government’s overall revenues during the five months amounted to 290.4 trillion rials ($1.96 billion), indicating a rise of 1.5 % year-on-year, while spending hit 659.5 trillion rials ($4.45 billion) to register a 40.6% growth YOY. Revenues associated with the sales of oil and petroleum products were more than the projected budgetary figure of 429 trillion rials ($2.89 billion). They reached 538.8 trillion rials ($3.64 billion), indicating a 62.4 % rise YOY. The government spent 249.1 trillion rials (about $1.68 billion) on development projects in the five-month period, which is lower than the target set in the budget law for current year’s first five months: 263.3 trillion rials ($1.77 billion). Tax revenues were estimated to hover around 603.3 trillion rials ($4.07 billion), but they reached 429.4 trillion ($2.9 billion), registering a 16.8% increase YOY. Overall, direct tax revenues stood at 190.4 trillion rials ($1.28 billion) during the five months, registering a decline of 3.4% YOY. Indirect taxes, including “tax on imports” and “tax on goods and services”, reached 239.0 trillion rials ($1.61 billion), indicating a 40.2 % rise YOY. The report also shows tax on imports generated 63.5 trillion rials ($429.05 million), 88.7% more than in the year before while tax on goods and services earned the government 175.5 trillion rials ($1.18 billion), up 28.3% YOY. Value added tax, which is a subcategory of tax on goods and services, increased by 11.9 % to reach 110.2 trillion rials ($744.59 million).